Deepak is entering his third year as an NCEP scholar, and is a well-rounded, studious, and conscientious 16-year-old student. He has passed all his classes in each year of his sponsorship, and his parents are also supportive of his education. 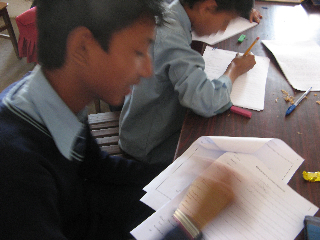 As he will be preparing for his School Leaving Certificate (SLC) Exams, NCEP Nepal volunteers recommend his enrolment this year in a supplementary tutoring program to give him the best chance at success in these difficult exams. We will also meet with him regularly to help him understand his options for next year, and to enable him to pursue his chosen course. Writing so fast that the camera can’t keep up with him!